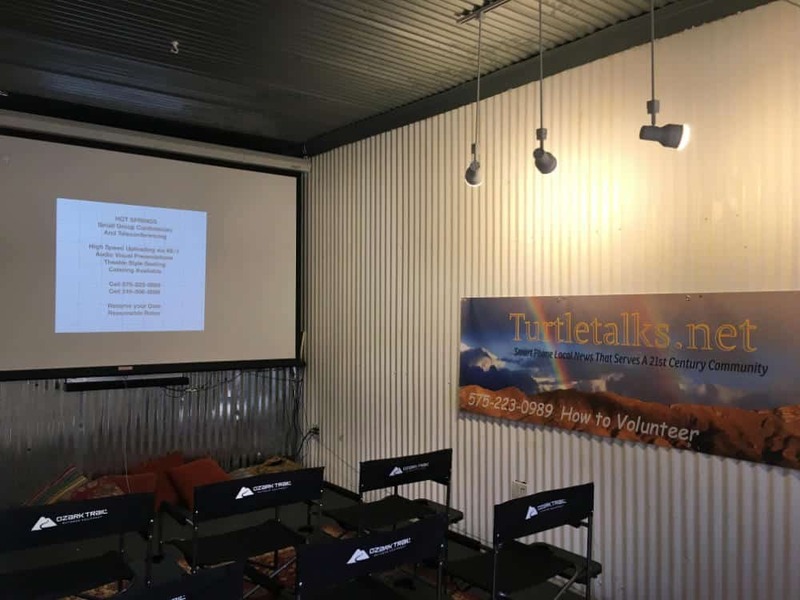 A small community venue showing meaningful humanistic films from various sources including GAIA, Netflix, Amazon, and others, offered free to the public to engender discussions. Open to groups for meetings and conferences. Stone Soup is a quiet, cozy and informal conference facility. Full catering is available; special diets are our specialty. Helpful and friendly staff. All venues in the hot springs district are within walking distance, including a microbrewery, an art cafe offering artisan coffees and teas, Me Gusta International food truck, and — just across Healing Waters Plaza — T or C’s premier hotel and spa, Sierra Grande. Small pets are accepted; we have a shaded outdoor area in the back with water available. Please call first with your requirements. seats up to 20; state-of-the-art 10 x 7′ high-definition screen; high-speed internet; Broadview video conferencing for up to 25 participants. Perfect for architects needing to show the details of a project. A fax, color copier (up to 11×17) and printer are available. High-speed dedicated internet connection reaches 28.5 Mbps upload and download speeds.